Photo created at http://www.MadMenYourself.com, all rights reserved. A post tonight to celebrate the upcoming return of Mad Men to our TV screens after a break of over a year. This American drama, set in a New York advertising agency in the 1960s has been credited with sparking a sixties revival in fashion, and as part of that, in drinking fashion. 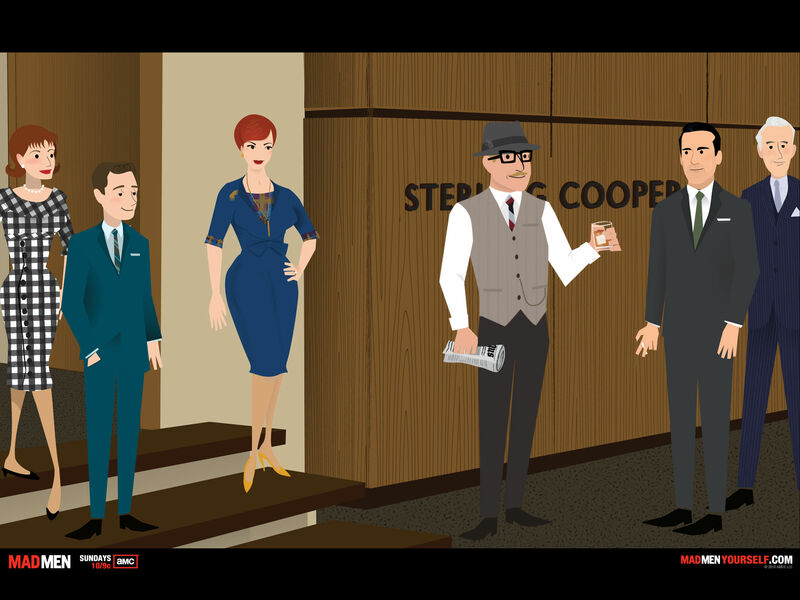 As a result, here is a quick rundown of some of the characters’ favourite drinks, as told to your host, on his internship at Sterling Cooper (pictured above handing Mr Draper his morning paper and Old Fashioned). 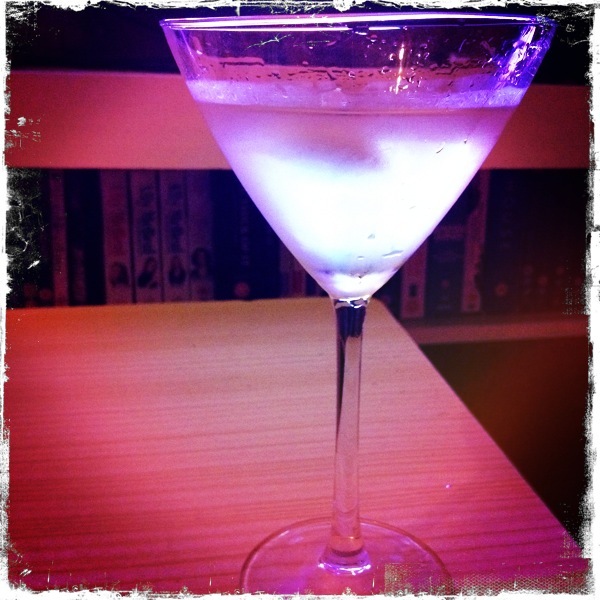 The Gimlet is attributed to the Royal Navy who added gin to their scurvy-avoidance rations of gin to help it go down. The vodka alternative became more popular in the 1960s, and Betty Draper is partial to the occasional Vodka Gimlet whilst conducting extra-marital affairs. Add a large measure of vodka and the juice of one lime to a shaker of ice. The Collins family were raised in New York in the 1870s. Tom always drank his with gin, while John preferred bourbon, and cousin Juan preferred tequila. These may not be a favourite of Sally Draper (we hope) but she’s been mixing them for her parents and their friends from a young age. Add a large measure of gin, the juice of half a lemon and a teaspoon of simple syrup to a shaker of ice. Shake well and strain into a highball. Top up with soda water, add ice and garnish with a wedge of lemon, orange and cherry. A classic drink of the fifties where Cary Grant and Jayne Mansfield shared them onscreen in Kiss Them For Me, the Stinger is also one of Peggy Olsen’s choices when out on the town. Add a measure of brandy and a measure of crème de menthe to a shaker of ice. Shake and strain into a brandy glass. This favourite of Don Draper and yours truly has been covered elsewhere, but let’s just say that like your author, Don Draper can mix these like a pro – and Conrad Hilton can attest to that. Muddle a sugar cube, two dashes of bitters and a sploosh of water in a rocks glass. Add ice and a large measure of whiskey. Stir and serve. A breakfast-time classic, and a staple of the Sterling Cooper meeting room. The Bloody Mary was developed as a hangover cure in 1920s’ Paris. Use pepper vodka for even more of a kick. Shake a large measure of vodka, a (slightly) larger measure of tomato juice, the juice of half a lemon, a teaspoon of horseradish, a sploosh of Worcestershire sauce and a sploosh of Tabasco with ice. Garnish with pepper, a wedge of lime and a stalk of celery. Another favourite of Peggy Olsen this milkshake-like drink was originally made with gin (an Alexander), which sounds truly horrific. Try it with brandy instead and it becomes more like a dessert. Shake a measure of brandy, a measure of crème de cacao and measure of single cream with ice. Strain into a martini glass and garnish with ground nutmeg. Roger Sterling, a self-confessed fan of only clear drinks, will opt for a Gibson, when a straight Martini just won’t cut it. Just be careful you don’t have too many with your oyster lunch. Stir a large measure of gin with a measure of dry vermouth and ice. Strain into a martini glass and garnish with three or four cocktail onions.